If a visual artist created more concentrated, exhilarating images of science, technology and the media realm during the mid-20th century than British artist Eduardo Paolozzi, then I would like to see them. Paolozzi, who died on 22 April aged 81, was first of all a sculptor, but the screenprints he produced in the 1960s rank as masterpieces of the medium. You could call them examples of Pop Art, but they come from a different conceptual and aesthetic universe to American Pop in the Warhol/Oldenburg/Ruscha mode. Where so much US Pop tended to pare down its subject matter so that the image emerged in high relief as an icon, Paolozzi was closer to the image-overload of James Rosenquist. He was a visual researcher, a cataloguer and collagist, producing densely packed, allusively wired images based on fragmentation and collision. His screenprints embrace modern complexity and deliver it back to us zapping with electrical power. Paolozzi amassed printed imagery with the same eclectic enthusiasm. In the late 1940s, while in Paris, he started making collages out of ads from American magazines, the covers of pulp novelettes and amazing stories, and scraps of packaging. He was a member in London of the seminal Independent Group, which focused on popular culture and modernism, anticipating many of Pop Art's concerns, and at the first meeting at the Institute of Contemporary Arts, in 1952, he spellbound the audience with slides of this material. In 1962, Paolozzi began working with silkscreen, assisted by screenprinter Christopher Prater, owner of Kelpra Studio in London. The screenprint Conjectures to Identity (1963) was the first sign of the compositional complexity to come. It includes patterned paper, technical illustrations, photographs of machinery and a scene showing people worshipping at an altar. In one print, the colours are a vibrant mixture of yellow, orange, purple and blue, but there are variations between prints, a technique Paolozzi and Prater used later so that every print in an edition has a unique set of colours. The vision of technological modernity that Paolozzi's prints offer is so compacted and multilayered that it seems as much like a hallucination of the future as a description of the present. His titles sound like science fiction: Universal Electronic Vacuum, Zero Energy Experimental Pile, General Dynamic F.U.N. His prints are the visual counterparts of Norbert Wiener's cybernetic theories and Marshall McLuhan's concept of the electronic global village. One of his finest creations, Moonstrips Empire News (1967), takes the form of 101 prints housed in a magenta-tinted plastic box. (It's a source of lasting regret to me that I failed to stump up the money to buy it for a bargain price in a Tokyo department store.) Surrealistic free association determines the relationship between images and texts — Paolozzi's influences included Marcel Duchamp's Green Box and the writings of Raymond Roussel, James Joyce and William Burroughs — and the prints can be arranged, viewed and read in any order. 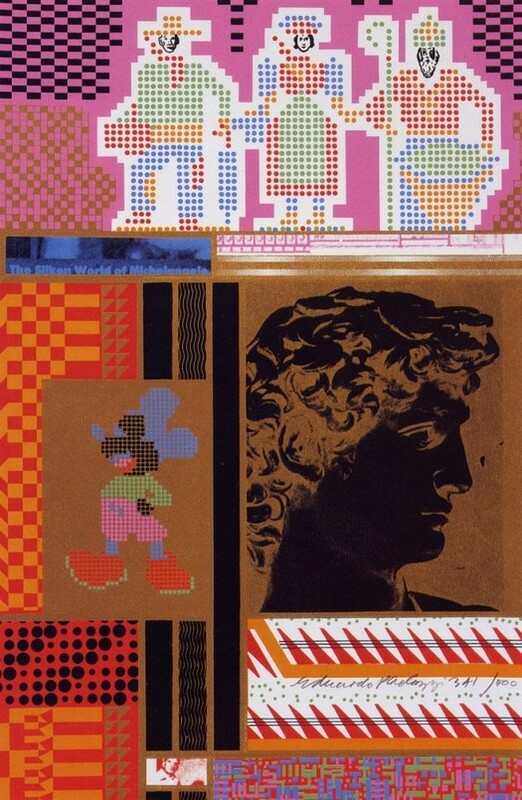 Paolozzi juxtaposes machine parts with fashion photos, Disney characters with classical heads; areas around the images pulsate with bands of abstract, optical pattern. The level of design in his graphic work (as well as in his sculpture) is exceptional and these images achieve a degree of graphic complexity that sets them apart from most 1960s Pop screenprints and exceeds anything achieved in graphic design at the time, in both formal and technical invention. Paolozzi went on to undertake many public commissions, such as the mosaics in the Tottenham Court Road London Underground station. There were graphic works, too. He considered becoming a commercial artist before pursuing fine art. In the mid-1980s, I came across a couple of covers he designed for reissues of the classic science fiction novels A Canticle for Leibowitz by Walter M. Miller and Earth Abides by George R. Stewart. But as many observers have commented — including The Guardian's obituary writer — Paolozzi's work after 1970 saw a decline in invention compared to the heights of the 1950s and 1960s, though he remained prolific. Artistic reputations are subject to fashion and in recent years, despite his knighthood and status as a member of the art establishment, Paolozzi's earlier achievements have been overlooked. He wasn't a figure that younger British artists tended to cite. My guess is that, in time, he will be reassessed as a print-maker of real brilliance and seen as one of the most outstanding British artists of the last 50 years. Few image-makers have portrayed the texture and seduction of our overlit technological landscape with such scintillating imaginative power. Fine tribute, Rick! The bit about Paolozzi's declining influence amongst younger artists rings sadly true. Usually when I mention an artist on my blog, people know who I'm talking about. I was surprised, when I ran my own appreciation yesterday, to find how few had even heard of Paolozzi, or knew that he'd put Surrealism and commercial "bunk" together to make a kind of Pop Art in 1947. People seemed to like what they were seeing, though. "It looks like Kandinsky dropped into a video game world," said one comment. "Nice." if anyone is ever able to hold and look at 'moonstrips empire news' and 'general dynamic f.u.n' then you'd really experience what rick speaks about in the last line of his piece. they say familiarity breeds contempt and often with things ingrained in a culture this is the case-paolozzi's work on the underground and some of his sculptures are so well known, so often observed that one almost stops seeing them. seeing the two works i mention above was/is like an electric shock-powerful, vibrant and at the same time injuring: so much work and so concentrated and right-too much almost to be inspiring (how would you ever come close?). and, as is often the case with these things, the ideas and words and ethos of the work is no less (probably more) relevant today. i hope some of his lesser known/harder to see work becomes more accessible-maybe we'll see facsimilie editions in the future. Just a personal note. 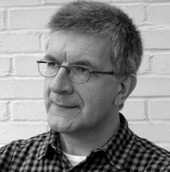 When I was 18 I landed a job as an exhibitions dogsbody at the Royal Academy of Arts in London. Paolozzi's work for the Tottenham Court Road London Underground station had just been unveiled and the RA held a small show in celebration. Relatively few people wandered by (it was shown in a room tucked away on the top floor above the restaurant) and on particularly quiet afternoons I enjoyed the lonely privilege of wandering around the room undisturbed. I didn't really understand the work but it felt vibrant, energetic, thoughtful and somehow connected with the urgent, fizzing London I had flown to. I'm still mesmerised by the Tottenham Ct Rd mosaics. The colours of the small square tiles are so rich and deep, as if they were mined from extraordinary earth. I wander the platforms searching for new patterns whenever I have to wait 12 minutes for the next Northern Line train. He was my tutor at the R.C.A.. An incredible man ,full of intuition and with a wonderful skill of knowing where to lead you to look to push your work further still. Greatly missed.